The picturesque village of Dunster in West Somerset is situated on the edge of Exmoor National Park, between the towns of Minehead and Taunton. This area of outstanding natural beauty was first settled more than two thousand years ago, and the remains of Iron Age hillforts are still visible on Gallox Hill behind the village. Dunster village itself grew up around Dunster Castle, built by William I de Moyon after the Norman Conquest in 1066 and mentioned in the Domesday Book some twenty years later. 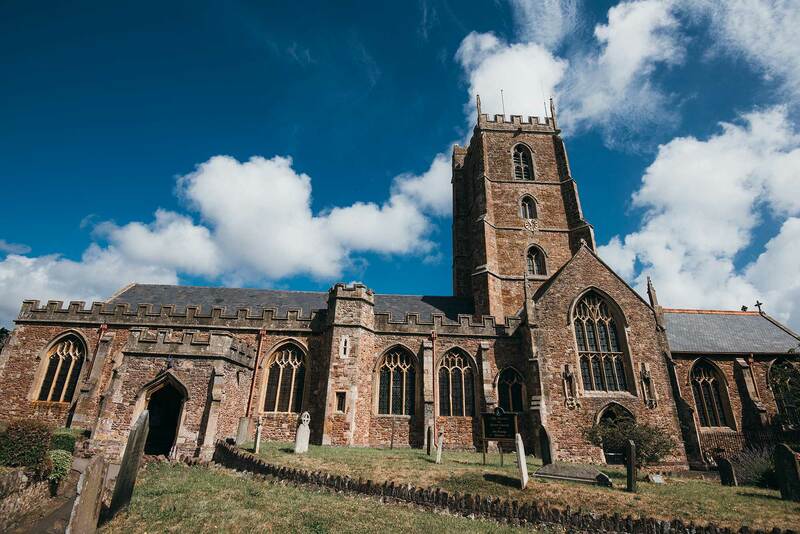 A Benedictine priory was established around the turn of the twelfth century, the remnants of which can still be seen today in the Dovecote, Tithe Barn and Dunster’s Priory Church of St George, home to our festival concerts. Dunster became a centre for wool and cloth production as early as the thirteenth century, and the famous Yarn Market (which still bears the marks of civil war cannon fire) was built by the Luttrell family in 1609 to encourage trade and to shelter merchants and their wares from the elements. Today Dunster is home to a thriving community and is a popular destination for visitors. While away a morning along the cobbled High Street and West Street exploring Dunster’s wonderful array of shops. There are plenty of places to eat including tea rooms (where you can treat yourself to a traditional Somerset cream tea), restaurants and cosy pubs. As well as the Castle and the Yarn Market, there are many other attractions, including the grade II listed Butter Cross, the Village gardens, Dunster Museum and Gallox Bridge. Don’t forget to bring your wellies; there are a multitude of sign-posted walking trails in the beautiful countryside around Dunster. The Tall Trees Trail will take you through the crown-estate owned Dunster Woods, where you can find the tallest tree in the British Isles. Take one of the many trails leading to Bat’s Castle for breath-taking panoramic views across the moor, from where you can make your way back down to Dunster through the Deer Park and the landscaped parklands behind the Castle. Trains from London Paddington to Taunton take just under 2 hours. From Taunton Railway Station take the number 28 bus to Dunster Steep bus stop. The bus journey is around 50 minutes. Alternatively, there is a Hertz car rental at the station and taxis are also available. The nearest airport is Bristol, where cars are available to hire, or take the direct train from Yatton (a 15 minute taxi ride) to Taunton, then the number 28 bus to Dunster Steep bus stop. From the east, leave the M5 at junction 23 and take the A38 then A39 following signs for Minehead. Dunster is just a mile or two before you reach Minehead. If you prefer a more scenic journey past Stonehenge, take the M3 then the A303 at junction 12. Turn off the A303 (a long while later) onto the A358 towards Taunton. At Williton take the A39. Parking on Dunster High Street is free, although spaces are limited and often in high demand. 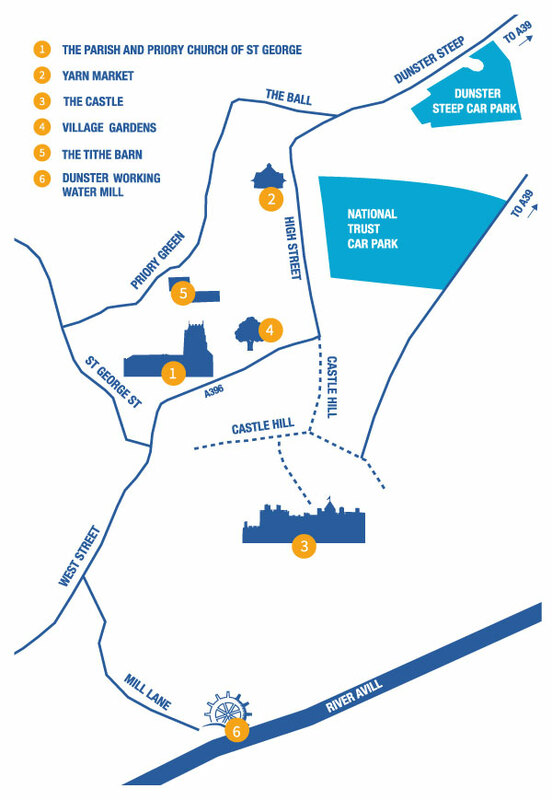 National Trust members can park for free in the Dunster Castle car park, which is off the A39 before the turn-off for Dunster Village. Non-members can also park in the National Trust car park for £2.50; be careful to check when this car park shuts as it is locked overnight. There are also public car parks on Dunster Steep and Park Street. Many of the hotels and B&Bs in Dunster have their own parking or offer parking permits to guests for nearby car parks.